“Superluminal” motion is old news to astronomers, but surprised our readers. Earlier this week, we covered astronomers’ discovery of fast-moving jets of particles, produced by the object that resulted from a collision of neutron stars. The jets were imaged at two different time points, roughly half a year apart. During that time, the jets appeared to be moving faster than light itself when viewed from Earth. In the article itself, I mentioned the “viewed from Earth” part to indicate that this apparent speed was a matter of perspective and that the jets were not actually outpacing light. I did that because I would need a separate full-length article to explain how that works. But, naturally, I got called on this in the comments—everyone knows nothing moves faster than light, so how could I possibly just skip over the fact that something looked like it was doing so? As I said, an explanation would demand a full-length article. So that’s what you’re getting. It shouldn’t surprise you that, to look like something’s moving faster than light, it has to be moving pretty fast to begin with. And, as mentioned in the article at issue, the appearance also depends on the perspective of the observer. So, to explain this, we’ll need a source of fast stuff and an observer we’ll place at arbitrary locations in our galactic neighborhood. Conveniently, there’s a little place in Switzerland called CERN that produces bunches of fast stuff. The Large Hadron Collider takes fast-moving bunches of protons and makes them even faster, until they are moving at 0.99999999 times the speed of light. Unfortunately, the ring of the LHC is surrounded by lots of rock that will decelerate these protons quickly (or, rather, cause them to collide with atoms and get reduced to subatomic particles). But for the sake of this explanation, we’ll assume that the LHC comes equipped with some magnetic ramps that can shoot the proton bunches off into the sky in arbitrary directions. We’ll need something sufficiently far away to aim those protons at. I’ll pick Alpha Centauri, a star that’s about 4.4 light years from Earth. That means that any light sent to Alpha Centauri will take 4.4 years to get there. If we shoot a bunch of our LHC-sourced protons at the star at the same time, they’ll have travelled 4.39999996 light years in the same time. That’s a difference of 0.00000004 light years—about 380,000 kilometers, or about as far away as the Moon. In galactic terms, light has built up a trivially small lead over our LHC protons. So trivial that the protons will arrive less than 1.3 seconds after the light. Now, let’s assume that some of the protons smash into atoms as they’re exiting the atmosphere, creating some photons. And they do the same thing as they run into something in the neighborhood of Alpha Centauri. That lets us track their progress. What that progress looks like then depends on which direction you’re looking at it from. 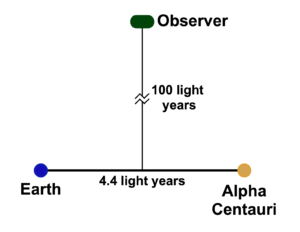 Enlarge / In the simpler case, our observer is equally distant from Earth and Alpha Centauri, 100 light years from an imaginary line connecting them. We’ll take the simplest case: someone looking down from above on a plane defined by the Earth-Alpha Centauri axis—say from 100 light years above it. From that perspective, the first photon arrives a century after the protons depart Earth. (Technically, it’s 100.024197 years, but we’ll go with a century). Then, 4.4 years later, the light emitted when the protons arrive at Alpha Centauri will be observed. I’d say that they’d get there 4.4 years and 1.3 seconds later, but those 1.3 seconds are far smaller than the rounding I did in calling the distances 4.4 light years. Those seconds would also be swallowed up by trivial uncertainties like the relative motion of Earth and Alpha Centauri in the 4.4 years of travel. That’s pretty much what you’d expect, and there’s nothing superluminal about it. To get something to look superluminal, we need to move our observer. Imagine a line from Earth extending directly through Alpha Centauri. We’ll put our observer on that line, 100 light years past Alpha Centauri. Then, we’ll shift the observer so they’re 20 degrees off that line relative to Alpha Centauri. What do they see? Trigonometry tells us that the observer is 110.6 light years from Earth, so it will take that long for the observer to see the light emitted when the LHC shot the protons off Earth. 4.4 years later, they arrive at Alpha Centauri and more light will be emitted. 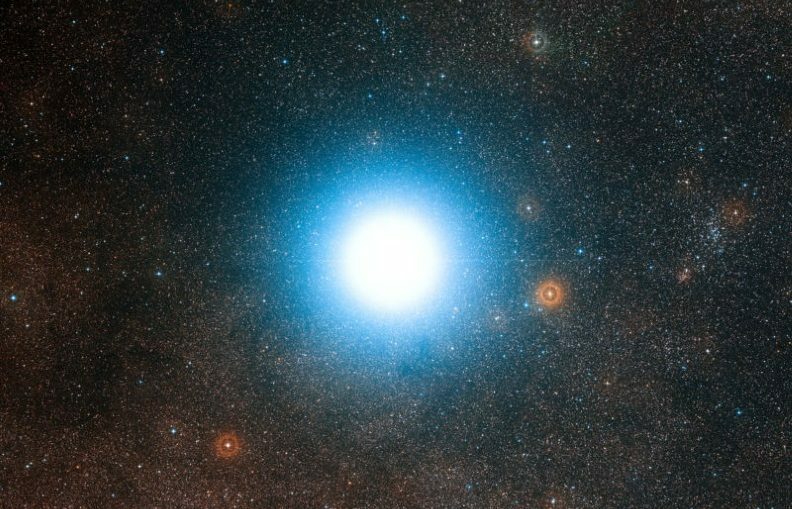 Using the same trigonometry, Alpha Centauri is 106.4 light years from the observer; adding 4.4 years of travel time, the photons from the arrival reach our observer 110.8 years after they left Earth. That means that light from the two events arrive a bit over 10 weeks apart. But the actual distance between the two points is 4.4 light years. So it looks like whatever caused the signal travelled 4.4 light years in just 10 weeks. That’s superluminal. Enlarge / Here, the observer is 100 light years from Alpha Centauri but at a 20º angle from the line between Earth and the star. Astronomical phenomena aren’t quite as fast as the LHC. If we have something that’s accelerated to 75 percent of the speed of light, the travel time from Earth to Alpha Centauri jumps up to 5.9 years. Now, the photons from Alpha Centauri arrive at 112.3 years after the LHC fired—1.7 years after the signal from Earth, which is still superluminal. The precise details of any observation will depend on the speed of the material, the distances involved, and the angle at which we’re observing things. But there’s a substantial range of speeds and angles that can create the appearance of superluminal motion. Which explains why, when presented with the appearance of something moving faster than light, astronomers would greet it with a shrug, confident that the quirks of the system explain the apparent violation of physics.